Once you have given into the hours and hours of begging from the kids because they want a pet, it's important to be prepared. Your number one fear as a parent might be the kids' safety, or you might be worried about being the only one looking after it once the kid’s excitement fades. Below are a few things you can do to help with the transition of the newest family member and ensure the kids do their part. Teach your kids how to interact with the pet properly. This is especially important if your kids haven’t spent much time around animals. Show them simple things like how to approach the animal without scaring it and how to pat it gently. Keep an eye on stress levels. If your new pet starts to show signs of stress, take them out of the situation so they feel safe again. If the pet's tail stops wagging and they start backing away or hiding, this may be signs of stress. Monitor the kids. Keep an eye on how the kids interact with the pet and supervise them as much as possible. Even the most well-behaved pet can react badly to a lot of poking and pulling from kids. Play safely. Teach the kids to play simple games like fetch, so they can learn how to play with the new pet in a safe way. If the new pet happens to be a dog, then this checklist will be a great way to get them trained. Some of these tricks are essential and some are a bit of fun, but they're all great for the kids to get involved! 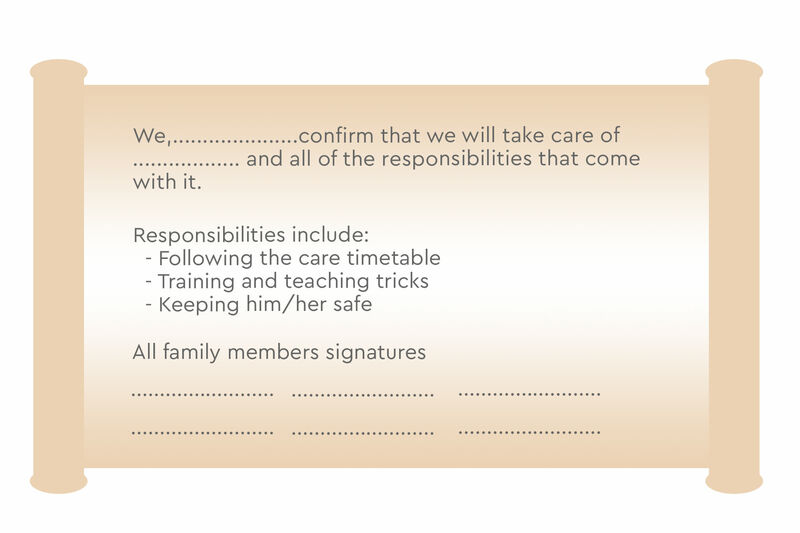 A timetable is the best way to get the kids involved in taking care of the new pet. This can include all of the jobs required for looking after the animal, such as feeding, filling up their water, grooming and exercising. Split the table into days of the week and tasks, then allocate the tasks to each of the family members. This way, the kids are accountable for their jobs and everyone is pitching in. It may sound a little funny, but a contract promising that each of the kids will look after this new family member can be helpful when the kids start dropping their jobs. When the excitement blows over and the jobs seem neverending, the contract is a good reminder of the promise they made to look after the pet.